I have finally managed to get some use out of my E-mu card! For months this was lying dormant because it was installed on an old 1ghz 512MB ram Windows box which was retired in favour of a 2.5ghz Quad Core with 4GB Ram. Updated: see bottom of page for Ubuntu 10.10 experience. Updated: see bottom of page for Ubuntu 12.04 LTS experience. So that’s enough background. Getting the E-mu 1820 working with Ubuntu has not been easy, and there are still a few niggles/limitations, but these don’t seem to be too much of a hindrance. Caveat: these are not step by step instructions, these are a rough description of how it is working at the moment. I have a E-mu 1010 card and a 1820 audio dock. The card is basically built on the Audigy chipset, but I’ll not go into that here as there is plenty of detail elsewhere on the web about that. Installing was straight forward; I simply plugged everything into the motherboard and connected the internal power cable from the power supply to the 1010 card to power the audiodock. I should probably have documented each step as I took it, but as this has been worked on over several weeks – in snatches of spare time – using a rather empirical method, this description of how it is working now is the best I have for you. Karmic Koala (9.10) is the Ubuntu version I am running. The first step was to see if the driver module for the emu10k1 was installed. In my system updating the firmware was one job which needed doing I downloaded and installed alsa-firmware-1.0.20 which included the necessary firmware for the audiodock. The default.pa was updated to use the jack sink only along with a little shell script as per these notes. These settings were identified with the help of this post. I actually have an issue with the soundcards being recognised in a random order so sometimes 1,2 becomes 0,2 !! One other thing that I do is have Qjackctl start pulseaudio for me using a little script which kills any running pulseaudio sessions before starting again. This means when there is a problem with Jack, I can restart as many times as necessary to get things back again, and pulseaudio will always restart as well. /usr/bin/pulseaudio -k && echo "Killed pulseaudio"
/usr/bin/pulseaudio -DnF /etc/pulse/default.pa && echo "Started pulseaudio"
Once I switched to using the jack sink, pulse audio has worked fine. The only niggle is that the default sink defaults to simultaneous despite my setting it otherwise, though I suspect that there is a way I could script that to fix it. This just means that my volume control on my keyboard has no effect until the jack sink is made the default output. Finally I had to work out what was connected to what. An evening of playing with alsamixer, jack, and some sample audio produced these Emu-mixernotes. This spreadsheet (here as a pdf) lists all the parts of the E-mu 1010 and 1820 that are visible in alsamixer, and attempts to identify their relation to the physical ouptuts and any other functionality. I now have multichannel audio inputs and outputs, so can happily play with ardour, hydrogen. various synths, my condenser mic and the record player, to produce sound!! However, MIDI is proving a challange at the moment. Although I can play some MIDI out of my Alesis SR-16, and can see the midiport lightup on my audiodock – I am not seeing any midi data make it through alsa. Update 30/12/2010: Ok so I have got MIDI in and out. 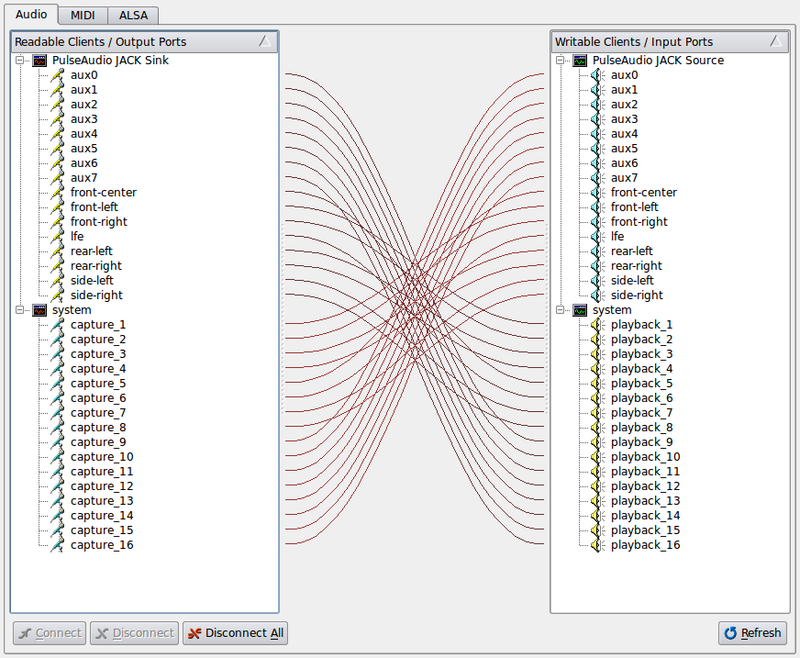 Jack is configured with an alsa_seq (seq) driver for midi. Jack will then see ports 0 and 2 of the emu. 0 is output on the front panel, and 2 is the input on the rear of the audiodock. Most things worked out of the box. Here is a list of the steps I took. Downloaded latest alsa-firmware, compiled and installed. Used my same scripts to launch qjackctl and pulse as per the details above. All done! And with no compiling of source. 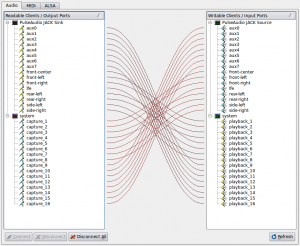 In fact I tried compiling the jack sink modules for pulse as per instructions above, and this did not work, but as the repository modules worked, I have just gone with them. Only down side is that MIDI on the EMU still does not work 🙁 . After that, I now had version PulseAudio2. I then stopped and started jack via qjackctl, and pulseaudio stayed running. But at this point I still had no audio, and it looked like this was because the jack sink module wasn’t loaded. I had taken a backup of my pulse config files before running the upgrade commands above, so was able to copy back the jack sink lines. 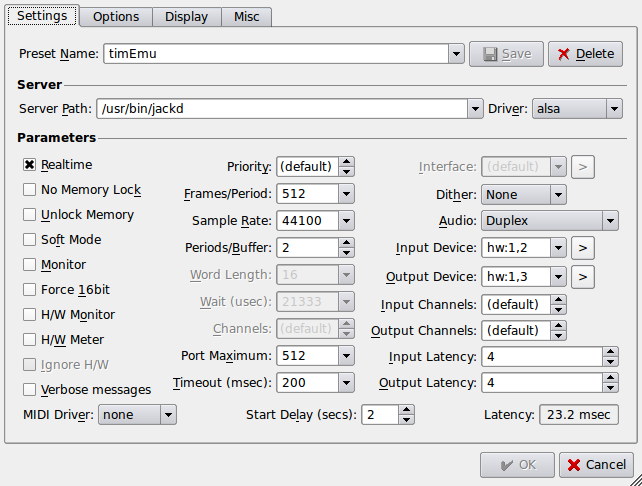 Then restarted everything via qjackctl again, and this time I can select the jack sinc in the sound settings. Now all I need to do is remap my keyboard multimedia keys, but that can wait – I can at least hear music! If media is playing faster than normal (ergo 44.1 vs. 48 khz).